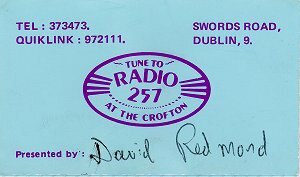 Alternative Radio Dublin, better known as ARD was at one time probably the biggest station in the City. Many now household names passed through the doors of ARD. The original ARD closed down on 31st December 1979, and re-opened a few days later as Radio 257. Names associated with ARD iunclude John Clark, Steven Rhodes, Mike Brown, Pete Williams, Mike Moran, Tony Allan, Dr Don, Paul Vincent, Ian Dempsy, David Kelly. ARD's frequency until 31st December 1979 was 1161kHz, which was well heard in the UK. 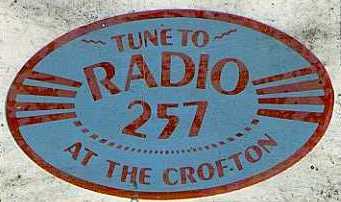 After they went off air, Radio City jumped on their channel, and when Radio 257 came back on air, they had to use 1152, which is a frequency used in the UK by ILR stations. Thus it was difficult in the UK to hear Radio 257 if you were near Glasgow, Manchester etc. 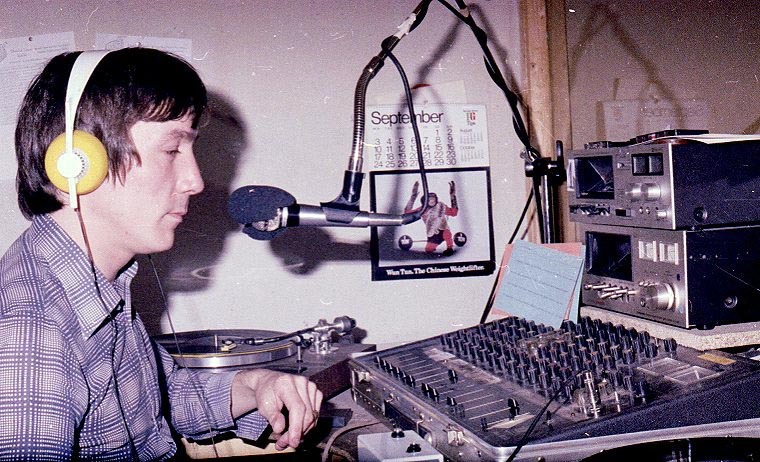 At some point in 1980, Radio 257 moved to 1143. This was probably to avoid a clash with Radio City on 1161. 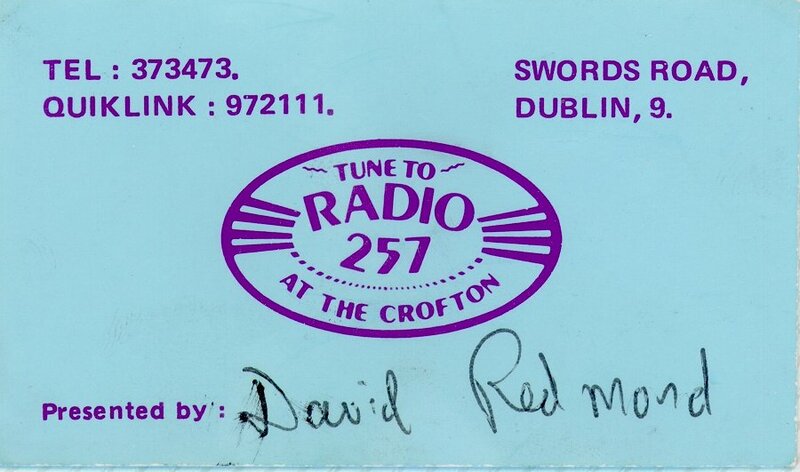 In those days, the favourite spot on the band seemed just LF of Radio Dublin's established 253m / 1188kHz frequency. Radio Dublin 1188, Radio City 1161, ARD 1143, Big D 1116. 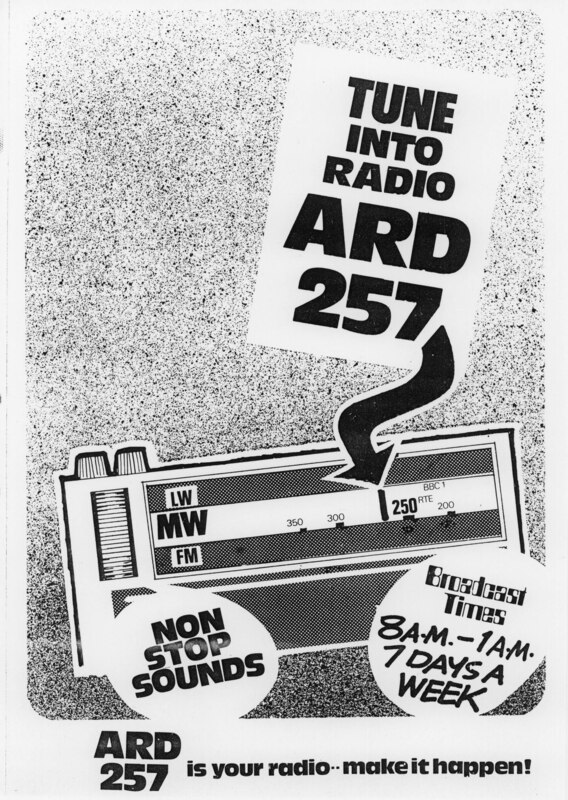 Radio 257 adopted the former name of ARD some time in late summer 1980. 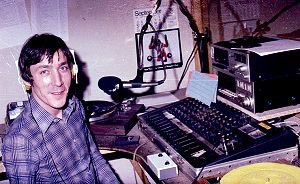 By 26th April 1981, the name ARD was again being heard. (Originally the following sentence was included, but where this date came from is anyone's guess. 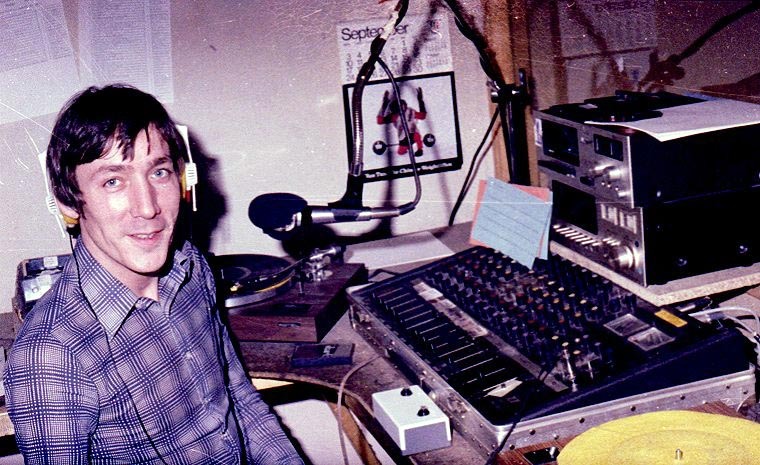 By 14th September 1980, the name was noted on air as ARD once more, and heard on 1143kHz). A photo that was emailed to the dx archive and forgotten about for some months. 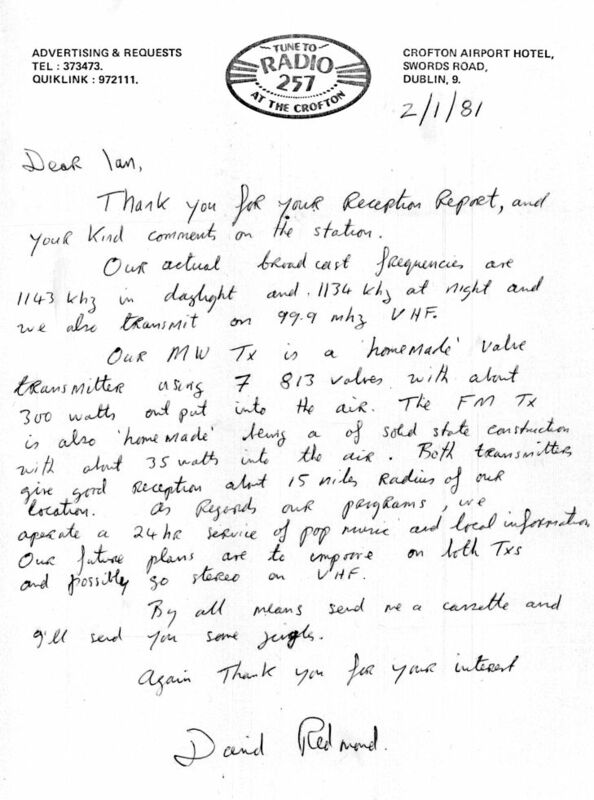 It was mailed from Eddie Lawless, who was on ARD from the start, until 1982. 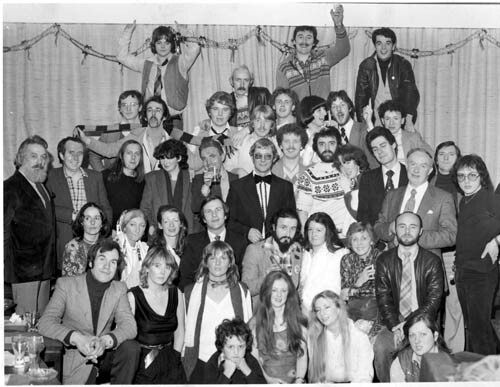 The email suggested it was the ARD Christmas party 1978, but the jpg was titled 1979. Thanks for the memory Eddie. The high res scan is left as it was to preserve quality. Names would be great. I recon I see Dr Don (centre front beard) and is that Paul Vincent (leather jacket front right), but I could be wrong!! 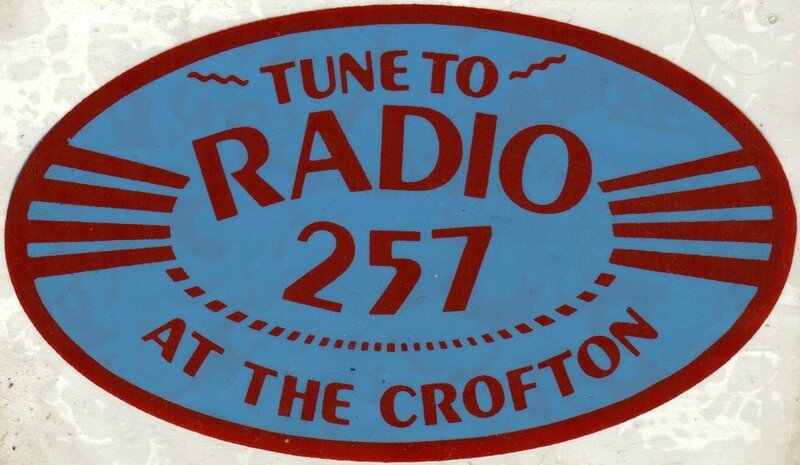 A very manky old Radio 257 sticker from about 1980-1. In used condition obviously!! On the right is another much cleaner sticker from Brian Greene. A couple of photos sent in 2004 after the death of Tony Allan, seen here in ARD in 1979. Unfortunately the source of the images has been forgotten. Perhaps Miles?? 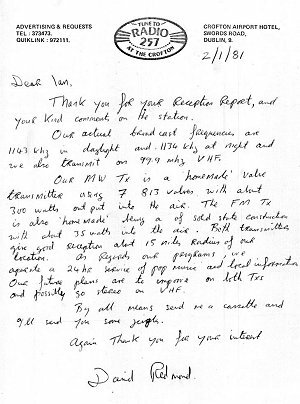 A letter received by Ian in January 1981. It includes a lot of technical information about the setup at the time.